The silver handicrafts industry in the Celuk Village is growing rapidly along with the development of Bali's tourism sector. The number of tourists visiting Bali has increased from time to time and it affects the increase of souvenir purchases number, including silver-crafts. Celuk Viillage is a traditional Balinese village that has changed into a tourist attraction with its trademark in the form of gold and especially, silver. The sustainability of the silver handicraft industry in Celuk Village is supported by the harmony of the collaboration between entrepreneurs and craftsmen in running the business. This research found that the Celuk Village silver handicrafts industry shows ability to develop and maintains its business, also to face many different challenges. The entrepreneurs and craftsmen in Celuk Village not only from local residents but also include migrants from outside Bali. This paper describes the habitus, realm, capital (social, cultural, economic and symbolic capital) and practice through Pierre Bourdieu’s perspective. The explanation is based on the empirical experience of local and migrant populations as craftsmen and entrepreneurs when pioneering, developing, and maintaining silver-craft business in Celuk. 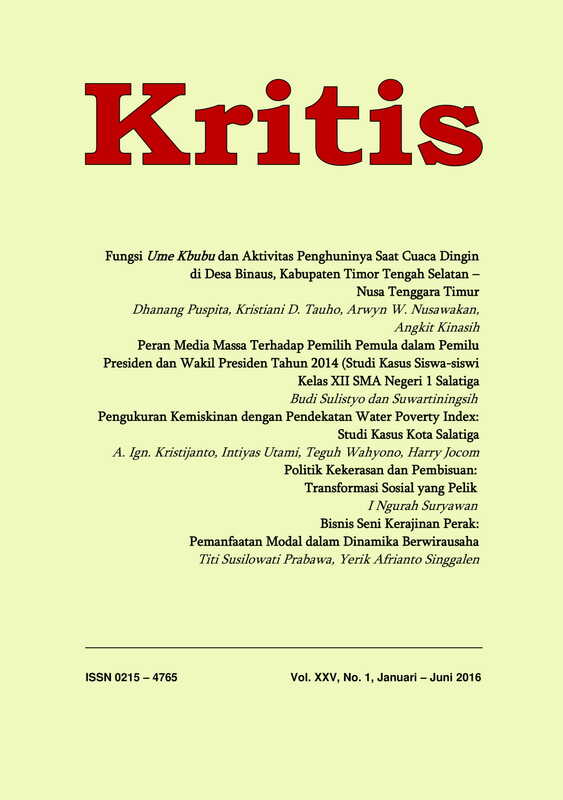 The research found that different from the locals, who can utilize social capital and cultural capital when pioneering, use economic capital when developing business, then symbolic capital in sustaining business, the access of the migrants to economic capital and symbolic capital is very limited. Therefore migrants use social capital and cultural capital when pioneering, developing and sustaining their business. Regarding to Bourdieu, the difference findings between local and migrants in Celuk Village shows that there is a fight over resources (capital) in the realm, and it forms a new habitus which is differentiation in social stratification between locals as dominant and migrant entrepreneurs as subordinate entrepreneurs.